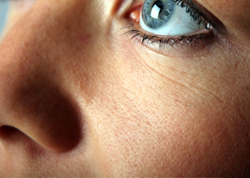 Thread veins are extremely common and typically appear on the face, body and legs. The appearance of thread veins may be affected by factors such as hormonal changes, smoking, prolonged standing, alcohol consumption or genetic predisposition. They can make people feel self-conscious and embarrassed. Joy Odili offers laser thread vein removal as a non-surgical treatment option for this common problem. This treatment is carried out quickly (taking around 30 to 45 minutes) and shows excellent results after two to three treatments, leaving the skin noticeably smoother and free of blemishes. This form of laser treatment has no downtime and is also faster and more effective than other treatment options. Laser treatment can be an effective way of improving the appearance of acne scars, even when there is severe scarring. It works by gently removing the top layer of skin to reveal new, less damaged skin underneath. Newer laser treatments – as offered by Miss Odili – achieve more subtle results by working on the collagen in the dermis without removing the upper layers of skin. This means that the treatment has a shorter recovery time. Miss Odili understands that acne scars, especially those on the face or neck, can make people feel self-conscious. Her laser treatment patients have seen a noticeable improvement in the appearance of their acne scars, which has given them a great boost in self-confidence. Laser treatments can be used to very effectively reduce the appearance of fine lines and rejuvenate the skin. They work by removing superficial skin cells and stimulating the production of collagen and elastin in the dermis in order to add volume to the skin and give it a healthier, smoother texture. Again, Miss Odili has worked extensively with the most sought after forms of laser treatment – Erbium, Carbon Dioxide (CO2) and N-Lite – and will be able to offer honest and professional advice about which form of treatment should deliver the best results for your skin.